March 21, 2012. A day I felt like I’d been waiting for forever… The launch – at last! – of my first novel, The Daemon Parallel, in the staff room at George Heriot’s. Now, I don’t know about you, but for me the words “staff room” conjure piles of marking, coffee cups, pinboards and an air of quiet concentration. So this big, vaulted chamber with stone fireplaces and an ornate ceiling was not exactly what I might’ve been expecting. But what a great and grand setting! And the walls had been decorated specially, with posters for the book, and a stage backdrop of the book’s logo and cover star, freshly-painted by the pupils. Elaine Clarke’s class had also been busy trying their hand interpreting some of the book’s characters. Waiting to greet me was Grandma Ives – alternately tall and groovy with upswept hair or gaunt, grim and ghoulish – Morgan barring teeth or trotting through the Alhambra Cinema, several terrifying Temperatoris, a thoughtful Amy, whirlwind Winter Gods, and the spidery Mrs Ferguson, lurking in her curtains. The pupils had been working from short, teaser-y descriptions of the characters, and it was fascinating to see what they’d come up with. Doors opened at 6.30, and by 7.00 the room was filling up. Alongside lots of friends and family, there were pupils from the school and their parents, and people from Edinburgh City of Literature, local book shops and other writers (some of whom told me they had already been reading – and enjoying! – the novel). It was a great turnout, and much better than I’d been thinking (and worrying) about. So thank you all for coming! After opening words by Elaine, and Benedicte from Floris, there were confident readings by pupils Joe and Jane that introduced the world of the Daemon Parallel, and The Story So Far. And then it was my turn! I read from chapter three, describing Cameron’s trip to a highly disturbing corner shop. Strange music roars unbidden in his ears, the shelves rotate, and he finds himself someplace quite different… Next there were questions from the audience – including a highly pleasing query about a possible sequel – and then it was on to signing books, drinking wine or juice (depending on age group and inclination) and having a generally wonderful time. My literary agent, the wise Lindsey Fraser, has warned me that after the excitement of a launch, things can go a little quiet… And the best thing to do is to imagine that silence is the silence of lots of people, feverishly reading your book. A pleasing thought! If you’re one of those readers, please do leave me a comment, and let me know what you think of your visit to The Daemon Parallel (or maybe mention it on your blog, or an online review site…) I’d love to hear from you! It occurred to me today that not only are there 14 days (14 days!) to go, there are also 28 chapters in Daemon Parallel… So as a teaser, I’m going to try tweeting those 28 chapter titles at the rate of two a day. 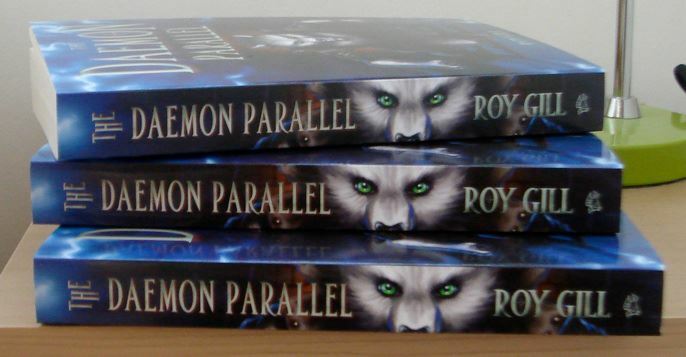 You can find me on twitter as @roy_gill (note the underscore between the ‘roy’ and the ‘gill’ – without it, you’ll tweet someone else – and he might get a little cross…), and find posts about the books by searching twitter for #daemonparallel. The chapter title countdown can be found by searching #chapterteasertweet. Today is Day 1, and reveals the innocent-sounding ‘An Offer over Coffee’ and ‘Night-time Stories’. But what spooky offer is being made, and to whom? And what sort of dark stories might be uncovered at night? In other news: the advance copies of the novel are starting to arrive. Here they are! I’m particularly keen on the eyes on the spine. And if you’d like a sneak preview of the actual novel, you can now read Chapter One online here. Just click ‘see inside this book’.